Rolls-Royce has christened its latest concept the 200EX -- a name that picks up on traditional terminology harking back to some of the company's more flamboyant pre-war "experimental" prototypes and subsequently revived on the 100EX back in 2004. However, it is well known that the luxury sedan will head into production as the long-awaited "Baby Rolls" rival to the Bentley Continental Flying Spur. The 200EX will be unveiled at the Geneva Motor Show in early March. 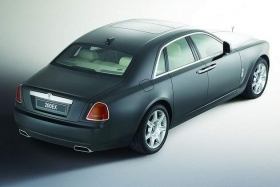 The official line is that the traditionally styled four-door concept car provides "clues to a new Rolls-Royce model scheduled for production in 2010." Don't be fooled. What you see here is the car Rolls-Royce plans to roll into showrooms, right on down to the exterior and interior detailing. Rolls-Royce design chief Ian Cameron gets the credit for the 200EX. By showing the new car early as the 200EX, Rolls-Royce hopes to stir more interest. The new car is set to adopt a traditional Rolls-Royce name-Spirit, Camargue, Shadow, Wraith, Cornich, Cloud, Seraph -- take your pick. Rolls-Royce won't give any hints yet on which one will be used. However, with rival Bentley having already taken it for its own luxury sedan, it is safe to say the name Spur isn't among those on the short list. "It's a modern execution of timeless Rolls-Royce elegance, breaking with some areas of tradition but retaining the core values," says CEO Tom Purves, He adds: "We expect the more informal, agile design to broaden the appeal of Rolls-Royce." The production version of the 200EX is due to appear at the Frankfurt Motor Show in September. The new car will be assembled alongside the Phantom at Rolls-Royce's plant in Goodwood, England, although much of its mechanical package will be pre-built at parent company BMW in Munich, Germany. More streamlined than the hulking Phantom, the 200EX cleverly combines traditional Rolls-Royce styling elements with modern design touches. Neat features include an imposing grille, squinty LED headlamps that house the turn indicators, a stainless steel hood, bold chromed door handles, rear hinged rear doors up back, a prominent C-pillar and a subtly angled trunk line -- all of which give the 200EX clear visual ties to the Phantom. Seven-spoke, 20-inch wheels complete the look. Commenting on the new car's most controversial design features, its new grille treatment, design chief Cameron said: "We wanted it to be less reminiscent of the traditional Parthenon style and more like a jet intake." In other words, it's sleeker and more laid back than any Rolls-Royce. The official studio based photographs don't show it, but the 200EX is a good deal smaller than the Phantom, stretching 212.6 inches long, 83 inches wide and 61 inches tall. The new Rolls-Royce shares much of its underpinnings with the long-wheelbase version of BMW's latest 7-series. The wheelbase measures 129.7 inches, and the chassis is set up with air springs biased toward smooth ride quality. Rolls-Royce remains tight lipped on just what engine the 200EX will use. The only detail being released was that will be a "new generation V12." In the words of Purves, "It might be our smallest car but it will still possess the indispensable Rolls-Royce quality of waftability."